Left his home town 15 years ago and started his spiritual journey as a seeker travelling to different cities of India. During this journey he explored many different ways to transform his life and failed many times until he found the meditation techniques of Ancient Vedas. 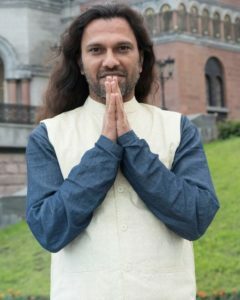 Inspired by these ancient teaching, he has been conducting classes, wellness programs, weekly workshops, Evening Social meditation events, Meditation teacher trainings in various parts of India and abroad for the last 10 years. Shiva practices and shares the teachings that he has learned directly from many different Modern New Age Gurus and Tantra masters. It is the same meditation practice that also is and has been the base of many eastern cultures for many centuries. Based upon his learning’s, Shiva Girish has written a number of excellent books on various forms of active & passive meditation techniques as well as yoga kriyas, that are designed to meet the needs of people in the modern world, as well as beginners, right through to yoga meditation teachers and therapists as a manual to guide them in their path of self-transformation in daily lives. His Spiritual meditation workshops, seminars and meditation training has to transform many people emotionally, mentally, physically, psychologically and spiritually.